Songs Originally Sung on Stage by Children. Composed by Various. Piano/Vocal/Guitar Songbook. Broadway, Children, Musicals. Softcover. 152 pages. Published by Hal Leonard (HL.312076). 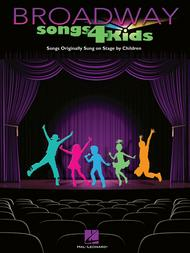 More than 30 songs made famous by kids singing on stage, arranged in piano/vocal/guitar notation. Includes: Castle on a Cloud • Do-Re-Mi • Gary, Indiana • Getting Tall • I Just Can't Wait to Be King • I Whistle a Happy Tune • I Won't Grow Up • It's the Hard-Knock Life • Let Me Entertain You • Little People • So Long, Farewell • Tomorrow • Where Is Love? • You're Never Fully Dressed Without a Smile • and more.